Easily and effortlessly cut your potatoes into thin strips with this Choice 1/4" French fry cutter! Featuring a durable cast iron body and handle, this durable cutter is rust-proof and easy-to-clean. Plus, this heavy-weight material ensures stability in the legs. For optimum stability and safety, mount your cutter to a cutting board, wooden countertop, or wall. Four screw holes are provided for your convenience. This cutter includes a 1/4" blade assembly and push block, but is compatible with all Choice parts (sold separately). This item is useless with the 1/4" cutter. It mashes the potato before it will go thru the cutters. Took out some of the blades and now make 1/4" x 1/2" fries. It would be nice if they offered some sution cups with it to hold it on the countertop. Thank you for your review! This fry cutter is an excellent value with many positive reviews. If you are unhappy with the design of this cutter, try the Nemco N55450-1 Easy Frykutter instead! Seems strong and sturdy. Expedites the fry-cutting process, and makes uniform cuts. Takes a little bit of muscle to press the potato through the grid, but I am almost doing it one handed because it slides across the counter top some and my other hand has to hold the cutter in place. Wish they had the suction cup model when I purchased this. This one is intended to be mounted to a table top, but we need to put it away between uses. This product works great for the price. Just disappointed in how hard it is to clean. Also the wingnuts are always loose even after I tighten them. My chef convinced me to get a French fry cutter instead of already cut fries and this cutter has me completely convinced and I am really happy with it. The build quality on these are not great... but I guess I shouldn't expect much from the price. The butterfly nuts fall out easily and get lost, and are extremely hard to replace (hardware store doesn't have that size...not other store either) But it's sharp, and cuts onions perfectly. Perfect Cuts!!! Amazing stainless steel blades, just one push and you hace the right size and the perfect cut fries, really hard and heavy use, amazing!! I’ve only used this once as it’s not easy to use, hard to push the potato’s through, it worked well. But need muscles for this product! just received my fry cutter and have already used it twice in one week! Easy to use and easy to clean! Cuts perfect every time! French fries made easier and quickly you can 10 lbs. of potatoes done in a snap. And having homemade F F is a great thing to have. Thank you for your feedback, Michelle! We are sorry you are having trouble with this product, we have sent you a replacement blade assembly. Love this French fry cutter. Just what I was looking for and what I expected. Easy to use and it was easy to install on the wall. Good price and fast delivery. Not my first purchase from webstaurantstore so for pleased with shipping time and products. Cleaning takes some time, but not a big deal. Pretty good cutter, holding up well to the abuse. Would have liked it to come with some mounting hardware to make it easier but wasnt too difficult. Make sure you have a good beam or plate to secure this to if wall mounting! Love this French fry cutter. One thing I really like is the different assembly of blade that Choice offers here on Web. This is a great product. This is a power house! I use and reuse and it works great. Its heavy and stable and is not made of cheap material. I make french and sweet potato fries and love that it comes with multiple blades for different sizes. So far this has been great for our restaurant. We attached it to our wall and haven't had any issues with it. It has saved an immense amount of time on prep. I would have given this item ZERO stars if I could. This product lasted exactly 35 days cutting fries in my restaurant before it had a catastrophic failure and split in half. Called to find out about replacement parts and was told they do not warranty this item. Considering we cut our own fries didn't have a choice but to fix the item so we could be back up and operational. Had to buy the replacement parts myself. Save your money and buy somewhere else. Thank you for your feedback, Kevin! We apologize for the inconvenience, we have offered you free shipping for your replacement parts. We have purchased other cutters. They are very durable and easy to clean. We purchased the whole set up instead of just the the different size blades so we don't have to keep changing them . They are still very sharp and cut fast . I had 2 problems with this cutter. 1. the bold unscrews very often and I didn't get the suction legs which made it difficult to work with. I am in the process of looking for replacement bolts. Perfect french fry cutter ever! A must have! Makes, making french fries so easy! They come out cut at the perfect size! Such a fast kitchen tool, they every one would love to have! Deliver super fast, which is great as this is a special order for a customer who need it for a concession stand in a few days. This item is built to last, solid cast pieces. We are very happy with this french fry cutter, it is sturdy and we like the fact that the blades can be easily changed for different uses and presentations in our kitchens. This french fry cutter is a great addition to any kitchen. 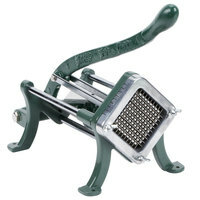 It's pretty heavy duty and easily cuts through potatoes when you apply the right amount of pressure. Potato wasn't cut all the way thru I tried a few times potato got stuck. Also had to clean it out with a knife everytime. Thank you for the review, Loren! We're sorry you've had issues with the function of this fry cutter. Use a swift and forceful push on the unit’s handle to get the best from results from this product. This will help the potato to move through the blades more quickly, reducing the likelihood of the potato getting stuck in the blades. This is a great french fry cutter. Easy to use and easy to clean. It is pretty heavy and made with high quality materials. Easy set up. I enjoy making fries at home, however cutting by hand was a chore and you could never get them uniform. I have used cutters from box stores and they never satisfied me enough to purchase one. I looked at commercial cutters, but were always too expensive, This cutter was reasonable, very well built, and works extremely good. It reminds me of the one used at a bowling alley in my hometown, way before frozen fries. So far I am very satisfied with the cutter and the service from WEBSTAURANTSTORE.. This is a great product, but make sure you have it screwed down or it will be a real pain. It cuts through fries quickly but at the end, clean up is a bit of a hassle. Great, fresh cut fries fast though and definitely worth the clean up. Great product, my aunts will be using this in their start up venture for their small Mexican restaurant. It was a good choice in price, durability and overall performance. Bought this cutter for a backup just in case my main one breaks. Have tested it out and would have to say that I like it for the price and ease of mind. This works great! It makes perfect fries, and everything comes apart to make for easy cleaning. The 1/4" size requires more force, so mounting it is a good idea. If you work in a high volume kitchen that makes french fries on a regular basis, this is an essential tool, I prefer this particular size french fry above all else. This french fry cutter has helped us cut back on our food cost! The machine is easy to use and we no longer buy in our french fries! Great product! I was very pleased with the performance of the cutter. It is reasonably priced and is very sturdy. Disassemby for cleaning is easy. It will provide many years of service. Use it on French fries? I'll go you one better. We use it to dice our onions for our Philly cheesesteaks. It does an awesome job!! This fry cutter works very very well. Absolutely worth the price. great for places who dont do a whole lot of volume and want to have home made fries. First time users and this cutter was very easy to use and clean. We used the 3/8 cutter and the fries were great. We had many great responses from customers. This light duty quarter inch fry cutter is great way for family to own one. I got one for the house and it works like magic. Love it. If you want to make your own french fries from scratch then this is the fry cutter to get. This french fry cutter is extremely durable: the main body is made up from cast-iron (very strong) assembly and is constructed very durably. The blades and the potato pusher is made from stainless steel, and both can be replace whenever needed or swapped to 2 other sizes of potato cutters. An excellent feature of this fry cutter is that it can be mounted on the wall. And for that price, this cutter's price and quality can't be beaten.